‘Would I see good things at all’? Categories: Ese Ifa, Iwure, Ori, Uncategorized | Tags: Crescent, Ifa, Iwure, Moon, Ori, Orisa, Orisha, Oyeku Ofun, Yoruba | Permalink. My aim in this paper is to examine, as much as possible, the Yoruba traditional account of human personality. Such critical examination will have to include the process of creation in the Yoruba belief: the concept of Ori in the Yoruba account of creation. I wish to apply philosophy as a tool to the account. Some notable scholarly works which are available would be of immense importance in this research project. Some common sayings in the society may also be, as a matter of explanation, useful in the understanding of the topic. YORUBA ACCOUNT OF CREATION OF MAN. According to Yoruba myth the decision to create earth had to come to maturity. Eleeda, God the creator availed himself of the clairvoyance of Ifa, the oracle, in order to ‘remember ahead’ so as to determine in what way and by whose agency the awakening of life, this transcendental spiritual instilment of profane matter was to proceed. According to Susan Wenger, “Obatala, the god who personifies the strength of purity, fecundity of truth and of white as the sacred sum of all colours in light-most-sacred-was to carry out this task in person. Ifa instructed him to pack the following paraphernalia of primordial creation in his ritual bad (Laba). 1) Efun, the sacred and potent natural chalk with which one masks oneself against the dangers of taboo. 2) Iyere osun, the wood-powder produced by termites eating the African Rosewood tree, the ritually potent powder in which Ifa, through his priest, writes his sacred number symbolisms. 3) Igbin, the great (vineyard) snail, Obatala’s own sacrificial food. The slimy fluid of the snail allows it to slide into and out of its shell with effortless ease. This fluid (Omi igbin), which is reminiscent of sperm, has great importance in all kind of proprietary sacrifices. Also, the spiral post that centrally holds up the central formation of the shell and roots the uniform contractile muscle of the snail’s soft body is the living symbols-analogy of the proto-helix and is the ‘post’ that is sacred to the goddess Iya Moopo (as the pillar that supports heaven). The strange, twofold, parthenogenetically sophisticated love life of the snail, which includes both anima and animus, is a hermaphroditic eroticism of both androgynous partners who stimulate each other to procreative activity by shooting tiny phosphorous arrows from the pores of their wet skin onto each other. This astonishing sophisticated primal procreative activity reverses our preconceived ideas of the atavistic comparative order of the evolution of species because it has no parallel with anything human. Reminiscent of the proto-motion of life in the nuclear cell that is the proto-helix of existence, Opo, the spiral post that we know so well from the Baroque Madonna is the symbol of a sacred fecundity. It is also in Igbin’s house, the snail shell. 4) Adie elese ma run, a chicken with five-toed feet, which is preferred as a sacrifice to Osun. The five-toed footprint of this hen is like the magic-mystical pentagram (Drundenfusz) with which Faust too held the Devil captive. It is said that Obatala let himself down ‘by a chain’ from heaven onto the primeval ooze. According to the statement of an Obatala priest, this chain is Obatala’s own source of force (Ase), his individual sacred energy, the hierarchical launching of evolutionary stages that led (and lead) continuously to the creation of the world. In heaven, they got impatient. They were waiting for news of Obatala’s arrival below, where earth was to be. When it had taken too long, Oduduwa was sent out the ‘junior’ god. He found Obatala drunk and sleeping on the arms of the palm tree, and he made off with the bag containing the creation paraphernalia. As in the case of Jacob and Esau, it was the ‘junior’ who got the better of the ‘senior’. Over the expanse of the still inanimate water (Omi, ordinary water, nameless and not yet entrusted with the spirit) was suspended Agemo, the chameleon, Obatala who had travelled in the gods armpit. The chameleon is an indispensable component of many sacred medicines and of medicine in the service of witch-craft. It is even ingested ritually and remains physically unabsorbed and active, ‘living on’ in the stomach of wizards and priests of quite dissimilar cults. 5) Agemo (or Oga) is not only a potent medicine; he is also a living metaphor of wisdom. Meta-intellectually, he is the symbol-antipode of the Tibetan ‘cloud of wisdom’ that is often depicted on the temple paintings, books, scrolls. The analogy lies in the assumption shared by both religion and opposite poles of ethical mankind, that wisdom is that which most sensitively react, ingest, transmutes ethically, adapts and reflects back on its author the ill all-inherent spirit of sacredness. The cloud reacts and adapts its form and volume through even the slightest atmospheric changes. The chameleon takes on its surrounding colouration without changing its own nature. Agemo neither let loose of Obatala nor did he loose his grip on the Laba, the ritual bag containing the tool of creation, now in Oduduwa’s possession. Stretched out between them, he remained attached to both by his prehensile tongue and tail. And then Oduduwa created the world by scattering chalk and the Iyere osun power into a soft, wobbly base for the hen. He puts the hen down , and she tries to keep her balance while treading laboriously, covering this first surface with pentagonal points of her five-toes feet; more and more pentagons-running, scratching and distributing matter that was magically impressed in this way until there was enough landing space to receive Oduduwa. He climbed down and found Ile-Ife as the ‘beginning’ of mankind and its fate in this world. The Yoruba traditional account of the creation of man, partly like the biblical account identifies two planes in the cultural cosmology: the physical plane and the spiritual plane. The physical plane, they refer to as the ‘Aye’ and the spiritual plane they refer to as ‘Orun’. Now, the Yoruba believe that human personality is made up of ‘Ara’ (body) and ‘Emi’ (soul) and the third metaphysical entity is the ‘Ori inu’ (inner head). Ara is the physical, tangible and empirical and it occupies space in time. This Ara is the handiwork of Orisa-nla a deputy Olodumare assigned the work of creating human body.2 Olodumare, according to the Yoruba, is the supreme head of the heavenly Orisas. As the supreme head, he then assigned to his deputies different assignments to assist him in the creation and administration of Orun and Aye. Apart from Orisa-nla, Olodumare assigned other duties to deputies like Oduduwa, Orunmila, Ajalorun, Oluorogbo and others. On this creation of human body, one tradition paints Orisa-nla also known as Obatala, as a disobedient and deviant divinity. Babatunde explained the perfect design which Olodumare set up for himself: that of making a peaceful world. In doing this “he also appointed Obatala to form the human image and he wanted both to cooperate with each other to produce a peaceful world of perfectly-formed, nice looking creatures”.4 It will be quite evident that the supreme deity did not intend that any ugly or bodily-deformed person be formed. But, with what is seen in Wande Abimbola and what obtains in the society, full of deformed and ugly people in as much as we have the beautiful ones, one cannot fail to conclude that Orisa-nla faulted the perfect plan of the Supreme Being. These deformed people were banished from their linage household from holding any family posts and are also “denied the full opportunity open to normal people within the narrow limits of the hierarchical system of the society” not only that, “at death they cannot become ancestors because they are not buried inside the linage household”. 5 Considering the quote above, a lot of questions will come to mind. For example, why were the deformed banished from the linage house hold? This could imply that the people dislike the deformed. But why were they hated? Where they hated for their deformed body or for the totality of their being including them ‘destiny’? In this case does a deformed body have anything to do with the nature of one’s ‘destiny’ albeit the former was made before the latter? If they were hated for their deformed body’s sake and since they didn’t create themselves, truly speaking, it means that, people abhor some handiwork or Orisa-nla. Then, it could directly mean, as shown in E.D Babatunde, that Orisa-nla is a deviant who faltered the perfect plan of Olodumare. Considering the banishment from another angle, it would be evident that the deformed people are of immense importance to the society. Although they were banished from opportunities open to normal people in the family household, they still took up the service as staff of ‘Obatala’. One could claim that probably, that could be part of the content of their destiny. In the Yoruba society, however, the priest and staff of Orisa are seen as virtuous more than the normal or deformed people. By that, many came to assume wealth without much struggle. They acted, in most cases as mediators between man and the Orisas. Then, can it be said that they deformed are, as a matter of fact, disadvantaged in the society? At this point, I can say that they hold most importantly a useful and helpful position in the society. Quite different from my proposition was that view of Epega D.O who believed that the time of creation, it was Olodumare himself who prepared the materials with which man was created. According to him, the physical part of man was created out of iron and clay. For him, “man is called ‘Ako irin’ (Male iron) and a woman ‘Abo irin’ (Female iron). The term ‘Okunrin’ and ‘Obirin’ are derived from ‘Ako irin’ and ‘Abo irin’ respectively”.6 It is claimed that after this preparation, Orisa-nla came to fix these things together and that formed different physical parts of man. Probably, the deformed and ugly came out of Obatala’s inefficiency in the putting together of those materials. However, from all indications, the Yoruba account agrees with the fact that Orisa-nla was responsible for the creation of the physical part of man with clay. The Yoruba also believe that at death, the ‘Ara’ will get decayed and go back into the ground. According to the Yoruba, it could also be inferred that the body is just a house to the real man which is ‘Emi’ (soul). The spiritual part of man is known as the ‘Emi’. While it is claimed that Orisa-nla moulded the body. This ‘Emi’ (soul) is invisible, intangible, not spacio-temporal bound and it is the one which gives vitality and life to the body. “Its presence in, or absence from the body is known only by the fact that a person is alive or dead”8 This ‘Emi’ is viewed as very fundamental to the existence of a person just like Henri Bergson’s conception of Elan-vital which differentiates between organic and inorganic substances and without which a person is only a lifeless carcass or a dead log (Oku). The Greeks, Plato for instance, the soul is what gives life to the body which is also the essential part of man and it is this same soul that thinks, feels and chooses.9 It could be said that since Plato existed before the Biblical doctrine, some have argued that it may be possible that the Christian doctrine of life after death was taken from the Greek conception of the mortality of the soul.10 One cannot hastily infer that the Yoruba belief in the importance of the soul was influenced by the Greeks or western views. This is claimed because the Yoruba account of creation (even not documented) had existed long before the Europeans landed themselves in the then ‘dark world’. Neither could it be said that the Islamic view influenced it as well. It also existed centuries back before the infiltration of Islamic civilization to the Yoruba kingdoms took place. The Yoruba conception of soul developed independent of any other tradition in the world. Opinions are different on the fate of soul after death. Those who maintain that the soul will continue the life in aye linked it with the fact that such a person that died must be a younger person who died accidentally without having fulfilled his destiny in ‘Aye’. Such a soul will have to look for another empty body, put it on and continue life in a distant place from the original place where he lived in his previous life. According to Makinde, the dead person could return to the former environment to continue life.14 This is of course open to questions like; where could the soul find an empty body since it was not reported that Orisa-nla created empty bodies without souls? At death also, the dead body decays, then where could such body be found? Such a body, if available, should of course have been seen before the soul will put it on since it is physical. Another point is that the soul and the dead person will put on the body which resembles the former. An instance is recorded in Makinde’s theory of immortality of the soul and seven heavens (Orun Meje).15 so, where does the soul find the body with such resemblance with the former? Those who claim that the soul goes to ‘Orun’ to become ancestors linked it with the soul of old people who have fully spent their lives and have reached their destiny in aye. It is said that, such people die and their souls go to Orun, join itself with the company of spirit and become ancestor. Wande Abimbola attests to this, 16 those who die young without fulfilling their programme in ‘aye’ are said to appear in different places, since according to the Yoruba, they cannot go to Orun to become ancestors. These are what they refer to as ‘Akudaaya’ or ‘Abarameji’. Apart from Makinde’s example, the society is believed to be full of them. However, in either case, according to the question raised by Makinde in ‘Orun meje’17 of the identity of the same soul after death. I want to agree with him that such identity may be very difficult if not impossible. This is so because each individual cannot describe the soul inside him and how it looks like moreover a soul has no identity as it lacks the characteristics of tangibility, not physical and doesn’t occupy space in time. We only feel its manifestation in our mental and physical events. The moment it disappears from the body, I don’t know how that identity can be formed except with the same body. But, with such platonic tradition of reincarnation, shared by the Yoruba, according to Makinde, it is quite difficult however, to arrive at such identity. There is another part of human personality which must be given a careful attention. Makinde observed the attendant importance in human ‘Okan’, which translates heart in English. It is noted that ‘Okan’ is biologically responsible for blood circulation in the human body system. The ‘Okan’ and the blood in his view, play important roles in the sustenance of the ‘Emi’ in a human person. In fact, in some sort of way, he actually identifies ‘Emi’ with blood and as that which represents the soul in the physical plane.19 This is evident in the fact that if there is no blood in the human body, the body can never be alive and if the blood is drained or removed out of the human body, it is identical with the removal of the ‘Emi’. Not only that, according to Makinde, in the traditional setting, it is a fact incontestable that whenever a person or life is sacrificed, it is the blood that stands for the life in its physical manifestation. This is also evident in Christianity, according to the Holy Bible, Jesus Christ broke bread in communion with his disciples. “And he took bread, and gave thanks, and brake it, and gave unto them, saying, this is my body which is given for you: this do in remembrance of me. Likewise also the cup after supper, saying, This cup is the new testament in my blood, which is shed for you”.20 In that statement, his blood was a representation of his life which he was sacrificing and the bread was the body as well, establishing the spiritual and physical importance of his death to his disciples before the actual occurrence. As a matter of cultural understanding, I would agree with Makinde on the importance of both the heart ‘Okan’ and blood ‘Eje’ as agents of the soul which has a great influence on the Yoruba theory of human personality, but I shall disagree on the fact that the blood (Eje) alone is strictly identical with ‘Emi’ because the blood is only necessary for the existence of ‘Emi’ but not sufficient in the sense that, biologically speaking, there are some other organs in the body such as the Liver (Edo), Kidney (), Lungs () Brain (Okpolo) amongst many which are also identical with ‘Emi’. Even if the blood is present in the body and one of these afore mentioned organs are absent, it will sufficiently mean the absence of the ‘Emi’ as well. It could be argued that without blood, all these organs cannot work but conversely, without these organs the blood’s function is also irrelevant and useless therefore there is a dependence of one on another and it would be unfair to ascribe superiority of the blood over other organs. Gbadegesin carries the importance of ‘Okan’ beyond mere physical level. He observed that since some mental and emotional events are attributed to ‘Okan’ apart from the biological function, and since these events are not physical, he then viewed that there is beyond the physical organ ‘Okan’. A spiritual Okan, just like ‘Ori’ Hence “this suggests that beyond the physical organ, there is a source of conscious identity which is construed to be invisible and more or less spiritual”.21 It is evident, from the fact that when Yoruba call a person ‘Alailokan’ (a heartless person), they don’t literally take it to mean that the person in question has no physical heart but they are using it in a metaphorical sense which could mean a cruel person or uncourageous person. Hence an ‘Olokan giga’ could simultaneously mean ‘a proud person or an optimistic person’, one who aims high, but not a person with a tall or high biological heart. As Gbadegesin portrays this, it is to mean that the Yoruba attached a kind of spirituality to the function of ‘Okan’, which as a whole, is different from the function of the physical ‘Okan’. The same significance of ‘Okan’ could also be observed in work of EB Idowu. 22 The whole point here is that in conjunction with the importance placed on Emi, Okan in its own part is also important. What I have been able to do here is giving a critical account of creation and the make-up of human person from the Yoruba point of view. Then, I have been able to talk on ‘Ara’ (body), ‘Emi’ (soul) and ‘Okan’ (heart). The Yoruba traditional belief conceived a man as comprising ‘Ara’ (body), ‘Emi’ (soul) and ‘Ori’ (inner head). The first two have already been discussed in the previous column. From all indications, the tripartite conception of human person is exclusively the view, which the Yoruba could claim its originality, although, it may be questioned and rigorously criticized, but then, there has not been any tradition around the world which held such belief before or after the Yoruba. The concept of ‘Ori’ as the third part of man and the second spiritual element of man is highly celebrated in the Yoruba belief. By way of explanation, we must not forget that when Orisa-nla moulded physical part of man, he moulded physical Ori so when we refer to Ori or Ori-inu, we must not think that we are referring to the physical head. But, when Yoruba talk of Ori they refer to a metaphysical entity which ultimately represents the bearer of man’s destiny and only the physical Ori as a mere correlate. According to the Yoruba account of human destiny and Ori, it is believed that before coming into the world, everybody was obliged to go and choose an Ori from among a large number of Oris stored in Ajala’s warehouse. Ajala, (a potter) has the duty of moulding human heads. The process of human creation is not complete without him. While Orisanla (arch-divinity) is understood by the Yoruba to be the maker of Ara (body), who later passes the lifeless figure to Olodumare (Supreme Deity) to put Emi (life giving entity ), Ajala is responsible for the creation of Ori. Ajala is a skilled potter, a drunkard, a debtor and an irresponsible and careless creature. 23 In any case, Ajala through his utter carelessness is responsible for moulding heads of different shapes and qualities (some are good and many are bad). In the house of Ajala, every man makes a choice of his own Ori, after which every man coming into the world passes through the water of forgetfulness-Omi igbagbe, which is the boundary between heaven and earth. In another myth the acquisition of one’s Ori is done by kneeling before the high authority Olodumare (Supreme Deity), who confers one’s portion, that is, what a person would live up to on earth. This type of acquiring ‘Ori’ is referred to as Ayanmo (that which is affixed to someone). 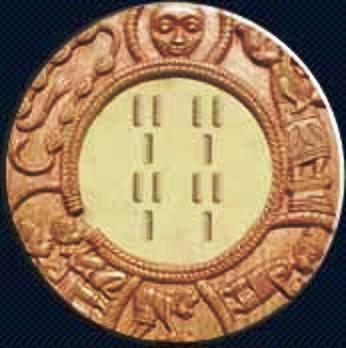 24 In all these myths, Orunmila (arch-divinity), the founder of Ifa (Oracle) system of divination, is noted to be a witness of man’s choice of destiny. Little wonder he is referred to as Eleri-Ipin (the witness of destiny) and the only one competent to reveal the type and content of ‘Ori’ chosen by each person. Lo to Alasaan ba rokun. Ori ni n o ro fun. 130 Orii mi, iwo ni. It is Ori whom I will praise. 130 My Ori, it is you. My Ori, it is you. 135 It is my Ori to whom I will give my praise. You who always remember your devotee. Without the consent of his Ori. You who allows children to be born alive. The Yoruba does not only see Ori as destiny but they also see Ori as a personality soul which is capable of ruling, controlling and guiding the life and activities of man. Generally, a fortunate person is called ‘Olori-ire’ (one who possess good Ori) while one who is unfortunate in life is described as ‘Olori-buruku’ (one who possesses a bad Ori). Furthermore, the word Ori, which is used to describe the personality essence, is also used to describe man’s double (Enikeji) or guarding spirit. When Yoruba says ‘Ori mi ba ni se’, he is referring to the fact that it is the (Enikeji) that has helped him. If a person miraculously escapes from harm, he will say ‘Ori mi yo mi’. Apart from seeing Ori as Enikeji, it is also seen as a personal god just like the great Ifa poem which states that “it is Ori alone, who could follow his own devotee to a distant journey over the seas (without ever turning back)”31 Every man’s Ori is his personal god. If an enemy plans some evil against a person, and the mischief is miscarried, people will say of the fortunate person, Ori re ko gbabode. Ori is seen as the guarding spirit. When an individual encounters injustice in the course of life and accepts his fate about it, he says ‘Ori mi a ja fun mi’ (my Ori would fight my course in pursuit of justice).32 When a father says to his son, ‘Ori mi a gbe e’ (may my Ori support you), he is praying that his guarding spirit may also support his son. In all these usage, Ori is referred to as a different personality that is capable of warding off evil, guiding, guarding a person and retaliating where need be. How does the issue of Ori as the bearer of destiny become a philosophical issue? It should be noted that destiny by strict definition is something predetermined and as such it is unchangeable. Such could be seen in the fatalist position of what will be, will be since everything was predetermined. 33 According to the Yoruba as held by Wande Abimbola and Makinde, though destiny is partly seen as unchangeable, on the other hand, it is believed that one’s destiny could be changed or altered but hard work and sacrifice or lack of them. This prompted Makinde to raise a philosophical question; does the changing of one’s Ori imply the change in one’s destiny? Although it might be difficult to associate the change in ones destiny with the change in ones Ori since Ori is metaphysical, the possibility of hard work and sacrifice make the change of destiny possible at least in the Yoruba view. I wish to agree with Makinde that Yoruba belief of predestination favours a weak destiny (WD) as claimed by Makinde. In agreement with Makinde and Gbadegesi, it is quite impossibility to have a rational or preferential choice in the choosing of an Ori. Apart from the fact that for a rational choice to take place, the knowledge of the content of each Ori must precede the choice, the personalities who make this choice are incomplete as they are only potential human beings and haven’t attained the level of actuality according to Wande Abimbola. This is rationally inferred from “once the choice of Ori has been made, the individual (now a complete human being)…” 34 this implies that before the choice of the Ori, the individual was an incomplete human being, how then is an incomplete or a potential man to reasonable and rationally be said to choose a choice which will be absolutely binding on him in Aiye? I fail to see my rationality in that instance. This is like holding a day-old baby responsible for its fall. It will not be difficult to see that the view of Yoruba conception of human personality is quite different from the western view. While the west views a person as comprising both mind and body, either mind or body respectively, Yoruba hold the tripartite view of man comprising of Ara (body) Emi (soul) and Ori (inner head). I have also been able to talk about Okan (heart) and its importance to human person. I have also been able to show my agreement with Makinde and Gbadegesin that not only there was no preferential choice in the case of Ori but also that the personality involved in the choice itself is irrational, incomplete and that cannot be said to choose any choice. 8. Idowu E.B. : Olodumare: God in Yoruba Belief (Ibadan, Longman’s Publication, 1962), pp.169. 13. Makinde M.A. “Immortality of the soul” opt cit, p.39. 22. Idowu E.B. : Olodumare; God in Yoruba belief (Ibadan, Longmans Pub. Co., 1962) p. 170. 23. Morakinyo, O.:The Yoruba Ayanmo Myth and mental Health-Care in West Africa. Journal of Culture and Ideas 1(1) p.78. Categories: Ori | Tags: head, Ori, Orisa, Orisha, Yoruba | Permalink. self), and Akunlegba (what is received kneeling). also agree that by the time people arrive in the world, through birth, they are totally ignorant of the type of destiny awaiting them. sions on the nature and meaning of human life are derived. fashioned prior to the selection of Ori. determines, finally, the destiny and personality of man (used generically) on earth. mines, finally and irreversibly, the destiny and personality of each human person. is unavoidable and could not have been otherwise. brought to fruition or a potentially bad Ori is improved. Orunmila before he is successful in life, he is merely following the path of destiny. be consistently held together in any discourse on the Yoruba concept of Ori. define predestination in terms of the mere possession of potentials. can be held to be morally responsible for his or her personality and life course. for the consequences arising from it. sense in which these notions and beliefs can be consistently held together. can yet be changed under certain conditions. what anyone tries to do. out any possibility of change. hard work and good character are as incapable of changing a hitherto bad destiny. the worst they can do is to delay its fulfillment). within the context of the Yoruba culture. uals exercise free will and are morally responsible for many of their actions. only those actions they are free to carry or not carry out. may be classified into two sorts: Factors of heredity and factors of environment. will and moral responsibihty as pseudo problems. to choose whether or not to steal or become a prostitute. to exert or not exert some effort of the will which will enable him to tell the truth. he could have told the truth. function of his free will. ous acts of free choice made by an individual up until any specified time in his life. of the habitual smoker in question that it is his or her Ori to develop lung cancer. some measure of authority that the events have been predestined. type of character they have and also for the ways their lives eventually turn out. ing predestined to have a husband). resort to explanations in terms of destiny. just unlucky, because they cannot offer any plausible explanation for the ill fortune.